Customer feedback, third party endorsements, and recommendations, help you establish credibility in a way that you simply cannot do in your own words. Words have power – other people’s words about you have more power (in the marketplace) than your own words about you. Systematically collect your customer feedback and create a PNG or JPEG file for each quote. You can do this through auto responder if you’ve given away a free report, ebook, or course, by having a message that simply says, ‘I’d love to use your feedback publicly, would you be willing to share a quote?’. Collect them, create them as an image. Pin them. See my example here. Do the same strategy, but this time, with recommendations you might receive via LinkedIn.com. See my example here. Do the same strategy, but this time, with blurbs from famous people for a book you write. See my blurbs from Jim Cockrum and Skip McGrath, two very well known internet marketers. Do the same strategy, but this time, with any 3rd party messages or articles that cite you as a source, expert, or contributor. See my example here. Arrange your Pinboards to feature a ‘What People Are Saying’ pinboard prominantly. I haven’t done this yet, but I will soon. Ps. 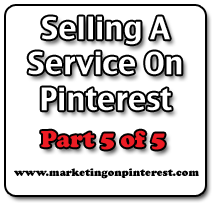 if you’ve enjoyed this weeks blog series, you might really enjoy my Selling On Pinterest Boot Camp. When you take it, you also get the Start-Up on Pinterest boot Camp, Marketing On Pinterest Boot Camp, and a sweet list of bonuses including my book Price It Like Picasso.